One of the easiest ways to obtain music legally is to record Internet radio. Tools for the job have evolved a lot over past years, from command line applications to powerful programs that can record dozens of Internet radio stations at the same time. StreamWriter is such an application. The program has a lot to offer: It can record music from multiple streams at the same time. Even better, it comes with a built-in auto-updating list of Internet radio stations that you just need to click on to start recording. You are only limited by the available bandwidth and your computer's processing powers. I had no problems recording ten different radio stations at once on my system. Here is how it works in detail. You can copy and paste a playlist or stream url into the form at the top or use the radio station browser on the right to find suitable radio stations. You can search for a specific station, or browse stations by genre, quality or file type. 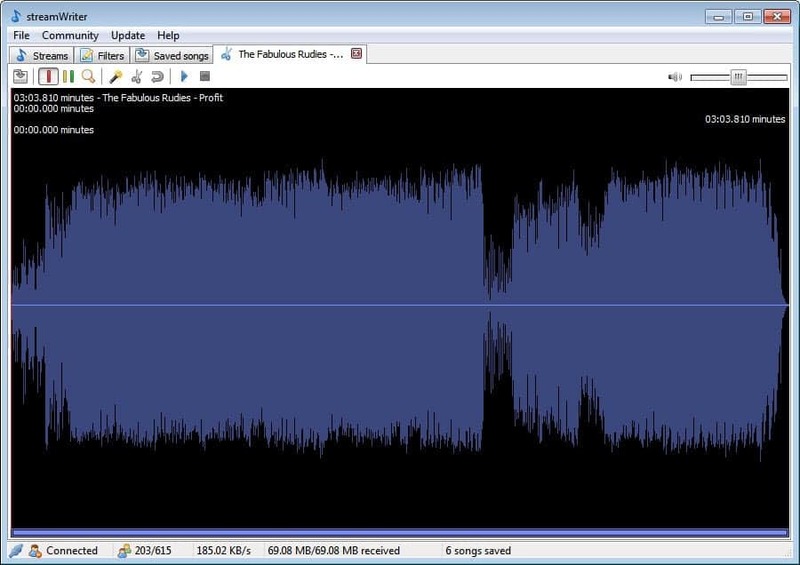 A double-click on a station starts the recording right away. You can also right-click stations to play the stream in the streamWriter application first which is handy to check out the quality and music. Additional options allow you to open the website of the radio station, play the station in an external player or save the station as a playlist file for later opening. The program will record music for as long as you keep it open and running. You can at anytime stop the recording of an individual station or all stations that are currently being recorded. Recorded songs are moved to the Saved songs tab where you can play them directly in the application. Another option is to cut recorded music which can be handy to cut off a dj or jingles that have been added to the recording. You can also delete or remove songs again in case you are not happy with the recording or do not like the song. Another interesting feature of streamWriter is located under Filters. Here it is possible to configure items for a wishlist and ignorelist. All previously recorded songs are for instance automatically added to the ignore list which blocks them from being recorded again. The wish list does the opposite; Songs of the wish list will automatically be recorded if they are found on a stream. You may also want to take a look under settings before you start recording Internet radio stations. You can configure file name patterns, post-processing settings and if the program should try to cut ads automatically. StreamWriter is one of the most comfortable Internet Radio recording applications for the Windows operating system. You can increase the size of your music collection in no time, or use it to record only songs that you have added to the wishlist. The program is available as a portable version and installer from the developer website. Update: StreamWriter 3 has been released. You can read all about the new update by following the link above. I discovered it some time ago. It’s a really cool program, which is still under development. Lot’s of features got added in the past. It’s free (even open source) and it’s easy to use. Currently it handles MP3 and AAC. OGG (vorbis) and WMA may come later. I think it is awesome. Great program, intuitive interface. It could use some polishing here and there, but the developers seem to be adding features on a regular basis. 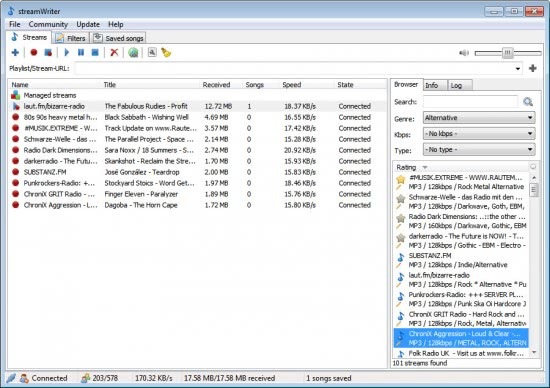 If you like music and want to record Internet radio, then this one should be in your toolbox. I’d like to point out that streamwriter is developed by a single person. I am excited, a Software I waited for a long time.